Gnostic Media is happy to present this exclusive video of John Marco Allegro in an interview with Van Kooten & De Bie. 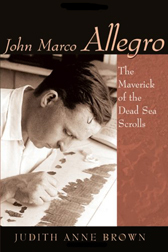 Recorded for and broadcast on Dutch TV in December 1976, this is the only available video of Allegro – the Dead Sea Scrolls scholar and author of 13 books, including The Sacred Mushroom and the Cross. Two other videos exist in the archives of the BBC/CBS, though repeated attempts to acquire them have failed. Thanks to Dutch researcher Gerrit Keizer for acquiring this video and making it available to Jan Irvin of Gnostic Media, and the Allegro estate. For more information, please see the official John Allegro website at http://www.johnallegro.org.